Market Sentiment Watch: Complacent broad market conditions persist. Single digit midget week continues today with a look at levered gassy name ECR. 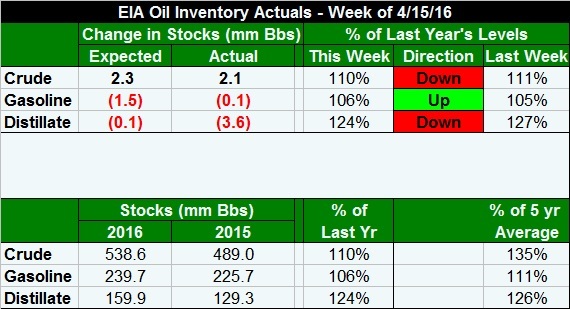 In today's post please also find the oil inventory review (inline crude build with down Cushing, record for time of year gasoline demand but a smaller than expected pull on a gasoline imports rebound, best of year distillate demand, another weekly drop in production as volumes continue to shadow our modeled onshore thoughts lower and we still expect near term acceleration vs the average over the last 11 weeks that has left production 263,000 bopd lower vs the end of January and down over 700,000 bopd since the April 2015 peak), comments on the BAS quarter, and some other odds and ends. We get Leading Indicators at 10 am EST (no forecast, last read was 0.1%). Crude oil closed up $1.71 (+4%) yesterday at $44.18 on the June contract which takes over front month duty today, after throughput rebounded and distillate inventories dipped sharply and as the EIA reported another week of falling US oil production bringing the 11 week total (since production began falling almost weekly again as expected at the end of January) to down 263,000 bopd. This morning crude is trading essentially fla.
Price Deck Watch: No changes to our forecast, just a reminder. 2016 E: $43.75 (range of $37 to $50). This is our baseline price driving our 2016 EBITDA models. Natural gas closed down $0.02 at $2.07 in a high volume reversal session after punching new highs in the early morning session. We continue to see current pricing as less noise and more an indication of traders looking forward to summer demand and curbed supply. This morning gas is trading flat. Street is at - 3 Bcf for today's report. We last updated this unowned name in here with the stock at $1.86 and at which time we indicated the lack of growth and budget outspend would unlikely be crowd pleasing. It traveled into 60 cent land by February and has since recovered to roughly that early January level. Prior to that we did a few full update pieces (8 entries including the January one) which can be viewed here. The story is pure play Utica and has not changed but much since then. The Basic Story - They remain a well hedged, gassy player focused on the Ohio Utica with a modestly levered balance sheet and a plan to modestly outspend cash flow this year after coming in below it last year. There acreage is primarily core Utica. Growth, like many gassy Appalachian players, has been phenomenal early on and per unit operating costs have fallen while they have worked to find premium markets for their natural gas volumes. At the same time, D&C costs per lateral foot have fallen sharply as they have for most players, which along with aggressive pressure management has helped to reduce breakeven threshold commodity prices. Budget: Last fall we said the budget for 2016 would likely be below $400 mm. They have guided to a back end loaded $168 mm budget (less than a 1 rig average program - see well counts cheat sheet). This compares to Street EBITDA for 2016 of $66 mm and interest expense of $52 mm yielding outspend of roughly $135 mm (assuming planned smallish asset sales are consummated). Volumes: 200 MM/d, down 4%, voluntarily curtailed (both curtailments and outright shut in wells) after reaching a peak quarterly average of 247 MM/d in 4Q15 and a 2015 exit rate of 270 MM/d. Our sense is that if our price thoughts for 2H15 (over $2.50) come to fruition ECR will opportunistically de throttle volumes later in the year (almost like flipping a switch with minimal capex expansion as they take volumes out of curtailment). Given that they have wells in the various windows oil and NGL pricing could lead to a temporary mix shift this year as well. But, as noted above, the planned outspend eats through a majority of the current cash hoard using Street EBITDA of $66 mm (our EBITDA is modestly higher due to our higher deck at just under $80 mm) and puts them at a lofty 6.5x net debt to EBITDA at YE16. That's a pretty steep jump that's likely the big weight on the stock at present. Our sense is that we'll have a good indication of the durability of strong pricing in 2H16 soon (traction being gained even in the shoulder as our weekly demand and storage comments have highlighted) and that the stock would react well to a decision to ramp volumes. Nutshell: We don't own it now. We're putting this one in the Bluelight Special camp on the gassy side of the aisle. They have quality acreage but growth is not there near term (by their own choice) and debt/EBITDA is elevated and set to become more elevated (as the cash and TTM EBITDA move lower) but covenants are not a concern at the moment given the undrawn facility (which we expect to remain undrawn this year). However, it is not so indebted as to scare us away for a Trade only type position, and, more importantly, to keep the name from rallying in the event we are correct on a rally in natural gas prices leading to a decision to bring at least a portion of the curtailed volumes back on to improve EBITDA. Completion services "continue to be impacted as the volatility and uncertainty in oil prices caused our customers to further curtail their exploration and drilling projects as the quarter unfolded"
​Notable Quote Watch: "Early in the quarter, we had anticipated that the growing inventory of maintenance and workover projects that were deferred at the end of 2015 would be completed in the first quarter. This did not happen as oil prices dipped below $30 per barrel twice during the quarter. These oil price declines forced many customers to delay projects until more stable oil prices returned. " Notable Quote Watch 2: "Pricing in all our markets and lines of business remains very competitive, and we continue to scale back operations and capital expenditures to fit cash flow and preserve our liquidity. As a result, we continue to stack equipment and exit markets where cash margins do not support maintenance capital expenditures." Notable Quote Watch 3: "Looking ahead, the fluctuations in oil prices create market uncertainties preventing us from knowing exactly what our near term results will look like. But based on current activity levels, we anticipate that our second quarter revenue could be down approximately 3 to 4% sequentially driven by a declining drilling rig count and fewer completions. Production related services should improve in the near term if oil prices remain in the $40 per barrel range, but these improvements may not be enough to offset declining completion activities." Margin Watch: EBITDA pushed further into the red. Nutshell: We don't own the name, we only own HAL in the Service space, but are now listening more closely for a potential bottoming in four additional names as noted last week. Conference Call: Today, 9 am EST. Tonight we get reports from Service industry leader SLB (unowned) and our largest gassy position (SWN). This entry was posted on Thursday, April 21st, 2016 at 7:09 am	and is filed under BAS, ECR, Uncategorized. You can follow any responses to this entry through the RSS 2.0 feed. You can leave a response, or trackback from your own site. "The Company has observed that U.S. onshore oil production peaked in March 2015 and has fallen since then by over 600,000 barrels of oil per day (“BOPD”), some of which was offset by new additions to production in the Gulf of Mexico (“GOM”) as a result of eight deepwater legacy-field developments coming on-line in 2015. This new production, from deepwater fields that includes Anadarko’s Lucius and Heidelberg and Shell’s Stones, offset significant declines in existing GOM fields. At current U.S. activity levels, Core predicts 2016 U.S. onshore oil production will fall approximately 1,100,000 BOPD, somewhat offset by GOM gains of approximately 200,000 BOPD, yielding a U.S. net decline of 900,000 BOPD and net decline curve rate of 10.1%." "Based on currently available worldwide crude oil production data, coupled with internal Core Lab data, Core has increased its estimate of the net worldwide annual crude oil production decline rate to 3.3%, as supported by recent International Energy Agency ("IEA") reports that worldwide crude oil production fell 300,000 BOPD in March from February 2016 levels. March was the third consecutive month of global oil production decreases"
"The increase in the net worldwide decline rate is predicated on sharper decline curve rates for tight-oil reservoirs and the significant decline in maintenance capital expenditures for the existing crude oil production base. This, coupled with the continuing decline in global production and the continuing increase in global energy consumption, should create a tight crude oil supply market for the second half of 2016, and that should lead to increased crude prices and industry activity levels worldwide." CLB – sees tighter crude markets in 2H16 leading first to higher prices and then higher service industry activity worldwide. Z late last week or early this week you wrote about a service company with little debt . I beleieve it was RAS or RES but can not find the reference- can you advise. I looked at the drop down but the symbol is not to be found. This guy was quite a package. He spoke at the Harvard Club of New York recently. U.S. educated i.e. high school through law degree. The thing that struck most was that he appeared to have no strong religious ideology impacting on him but was a very logical and clear thinking person. One of my thoughts was that it would appear that the Iranian leadership could find him a threat at any time. I'm surprised he remains at his post. He was brought in and out of the speaking site by a group of minders which made it impossible to speak with him. Clearly they don't want him free associating. His main point was negotiating 101 i.e. the best deal is a win win one and you need to understand and define the main points of conflict. He stated clearly that Irian had no sectarian issues with Saudi and that the issues were all open to negotiations. They did not feel it fair for them to take a cut in production below their old opec allocation unless saudi did the same.But did not see the wasabi/sunni issue as major in their differences. Pointed out that the world said nothing when Sudam attacked them with chemical weapons and used air attacks on their cities. As such they want the ability to defend themselves. More nationalist than religious in motivation. This does not explain their support of the creazies ( Hazbula etc) fighting Isreal . His message if not the leadership's message was that by understanding source of differences compromises could be achieved. Sounded better than their actions have suggested. BAS call about to begin, notes in a bit. where did you find those CLB comments? re 9 – Re CLB (unowned) – 1Q16 was announced, we didn't have them on the calendar so saw it a bit late. Debt restructuring remains top priority but nothing new to report today. Q) "you're not recovering a forecast but I am" – asking for status of fleet, how much is going to cost to unstack that. A) BAS has a monthly program for all pieces of equipment that is stacked, we start it and put it under some stress to keep it in operating condition … says most of stacked industry equipment is not getting that treatment. Called it 7.5 cents per $1 on replacement costs or $750 to $800 per horsepower. A) Newer fleet, were working a lot of lower pressure jobs before it got stacked. A lot of the fleet that got stacked was near the end of its useful life right before it got stacked. Then others are cannibalizing their fleets to maintain what's still running. There is a lot of horsepower that will never come back. Saying others are looking at 50 to 70 cents on the dollar . At that point those guys are better off building new pumps. ZComment: Stronger E&Ps will have less trouble with this as they have maintained some level of activity, will have better choices. A) Not coming down much last 4 to 5 months – just less jobs to bid on. E&Ps not asking for further discounts … just don't have any work to do …. wow, doesn't sound like a lot of DUC work in progress. A) Towards year end 2015, we saw more and more operators shut in stripper wells. Starting to see some of that work getting done with oil prices in the $38 to $40 range. Says that inventory of delayed work being done. We had noted this previously with the plummet in the workover rig count. Bloomberg still at just under a 4 Bcf build today. Anyone see Robry? BCEI up 19%, again, now $3.50 … how odd for the shorts. BAS – little new, no improvement in visibility, call ongoing. BCEI – trading like they have something close on RMS … more likely on that one than on the sale of the Mid-Con. BAS – thinking in this cycle that utilization rates > 60%, not the past cycle level of > 70% will warrant pricing increases. re BCEI- as you pointed out, the original deal was within $2 dollars to where we are today. The Irainan FM very tough as he understands how we approach things. Most impressive was his apparent lack of relgious coloring to his approach. re 21 – good luck to them with that. SUNE (unonwed) – filed Ch 11.
re21..looks like crude using that Libya info to pull back…. re 28 – could be that and Saudi, Russia, Iran showing off the size of their potential so to speak; either way, this last little move up didn't see to be warranted yet. Clearly balancing forces at work between declining non OPEC volumes and still rising demand but prefer more gradual, boring move up with periods of contemplative pause. AR – Jefco raises target to $24, rating stays Underperform – that's OK, you can stay underperform and just raise the target every other month or so to track its progress higher this year. re 31 – thanks for that. This time of year models can be a bit squishy, and this year more so than others given the switch from 3 to 5 region reporting but so far, consensus has been nearly spot on. If traders are thinking something is up between BCEI (up 15%) and SYRG (down 4%) they're probably going to be disappointed. By the way, is Gartman still breathing? Oil did tap $44. Oh wait, he's fine, now "going with his gut" on metals …"wants to own things that would hurt if he dropped them on his foot"
Honestly, a barrel of oil would take his foot clean off. +7Bcf vs +4 Bcf expected. Meh. BOP – Re SYRG – I do have to wonder about the growing time gap between the cash raise and the lack of a press release saying we've acquired beautiful Core Wattenberg from Private Niobrara LLC. Makes one think the private sellers want something more. About the only thing I can think of re: BCEI's move is that they have found another buyer for the RMI assets. That would be a god-send for them… and give them enough optionality to tread water for higher oil prices. At WTI $43 or higher, their asset base "works." At WTI below $43, they live… but can't grow. re 38 – and the Mid Con is out there for sale too though I think that's early. Agree re outsized moves at times like these. Would argue a lower price for threshold economics but have already done so. 34 Gartman – Always shocked at how little he brings to the table. Chart is moving from lower left to upper right. Must be a buy. He must have some pictures on someone in power. Still think his Uber comment as spectacularly foolish. #37 — I think you've seen the nail and hit it on the head there. I don't think SYRG would have done that capital raise, unless there was something tasty lurking on the table that appeared to be in reach. They must be working on "stuff"… but when and at what price? Higher oil prices — perversely — do NOT help them in their King of the Wattenburg Strategy. So, actually, when prices are up… SYRG may continue to go down. Kind of a "natural hedge" in a way, eh? Not one l like though… would much prefer if they could convince some private owner to hand over the keys to their car and take stock and cash in SYRG in return. Waiting…. re 41 – That makes complete sense. For once Lynn must be rooting for a certain 30 year old in SA to say the next market tripping thing. #42 — yes. I think Lynn would dearly love to see oil prices do an Acapulco Cliff Dive. Just until he can snag the Tasty Asset off the table. RE 37, 41: Due to the relative scarcity of available core Wattenberg acreage, and PDCE sitting there ready to pounce on an offering that approaches attractive valuations, SYRG may have tough competition in what does not look like a discount buyers market atm. #46 — sums up the situation rather nicely, yes. re 46 – true and there are others there likely not willing to let things go cheaply either (NBL, APC). RayJ out with several price target bumps in the energy space. 40 – but he has all of that rich mahogany…leather bound books…and elaborate lawns and fountains! Thanks for the gas data. If we get a big bounce in natty this summer on demand and lack of supply, REXX pretty interesting with zero debt payments basically for a year. Give them credit for pulling rabbits during tough times. 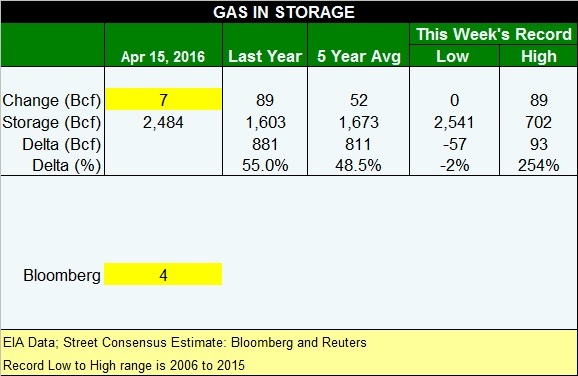 Could have heating days for the north and west combined with cooling days in the south–moderating seasonal natgas demand falloff. re 51 – yeah, not selling. re 52 – It should move above it next week but we will remain out of record territory and claw further away at the 5 year average surplus. I don't do weekly numbers but my seasonal view has a very similar profile to 2012 to it terms of total build from trough. Very little help in that from production, a bit from an expected net imports decline YoY and more from electricity generation with flat Industrial (held at near record levels), flat Residential and Commercials and flattish Lease and Plant fuel demand. HAL – the pop pre Monday earnings continues. Marketing "hoping" they announce the long engagement with BHI is at an end. Highly likely they don't. SWN edging over $11 in front of tonight's report. We have not sold a share though we note many analysts gave up their ratings for dead at the time of the 4Q call. Crude nearly back to $44. Will be interesting to see CFTC #s tomorrow afternoon. re61- what you thinking in regards to that ? re 62 – covering on the short side, uncertain whether we see longs build or not. Story on YFinance claiming Saudi realized it would have been effectively broke by 2017 on current path. There is a lot of noise out there these days from what at times looks like legitimate sources. it took some time but the XOP hit the measured move target of 34.90 and beyond. My next target is the 250 day ma. Nothing special about it, but on a weekly chart we are still in a zone of pretty thick resistance so I think things should slow down a bit from the pace they've been on….here's a link to my XOP chart….with the 250 ma target…https://stockcharts.com/h-sc/ui?s=XOP&p=D&yr=0&mn=5&dy=3&id=p34835826934&a=455487308. Both oily and gassy names look lethargic today. Here, reading, shout if you need something. At 1:30 est the energy sector just poked it's nose ahead of Telecom & Utilities to now be the #1 sector ytd. Guess the deflation, terrible global economy is getting another look. re 72 – Hear ya, broad market looking tired to me here after the recent pop up. Yawn. Any insight on the KMI pipeline cancellation ? – Northeast Energy Direct (TGP Northeast Expansion projection) – it did not garner enough interest. – It was to add capacity across New England. re 77 – yep, jives with EIA. RE 63: Doesn't the COT report miss important data you might be interested in? For instance, when traders sell spreads (sell later month and buy prompt month contracts at the same time) the COT records a long and a short at the same time, for a net of zero. Yet something important happened. In a strong contango market like we've had, where future dated contracts sell for higher prices than prompt contracts, wouldn't bullish traders sell that spread in size to capture a bullish move in crude prices? The effect would be to change the futures curve from a steep contango toward flatish, and then to backwardation. We have seen this happen with the crude futures curve this year. Yet those bullish spread trades don't show up in the COT report, even though they should have been sizable in volume given the changing shape of the futures curve. Am I understanding this correctly? re 79 – They do provide spreading data and I don't use that. But the basic relationship of expanding or contracting net longs for non commercials and oil price movement has held up pretty well for a long time. And I only use it as a gage of sentiment and not as what I should be thinking or doing, I take that cue from the fundamentals. Everything green for me. You explained SYRG earlier today. What's with NFX. Personally and also when I participated with them as a drilling partner (minority) they never performed. Is it my karma or what's going on? re 83 – can you be more specific with NFX question. They are good operators in my view. re 85 – yep, second time in 2 quarters they upped their view on global decline rates. Very tough to hold it flat with drastically lower spending, eh. RE 80: For income objectives I do invest in midstream names, though not all are MLPs. Currently I hold positions in EPD, TRGP, WPZ, ETP and MPLX, with a trading position in WMB. All of these have heavy exposure to natgas and NGLs. EPD and TRGP are the #1 and #2 exporters of NGLs, but each has important other assets as well. EPD is probably the safest name in this group. MPLX is backed by MPC, but it recently acquired Markwest–the big natgas midstream name with a huge footprint in the Utica/Marcellus as a fractionator/processor–solid long term growth prospects there. WPZ has the Transco pipeline system and WMB is its parent/sponsor. ETP is the heart of Energy Transfer's asset mix. WPZ, ETP and WMB are all caught up in the ETE/WMB merger fiasco, which brought valuations down considerably (and got me interested). Likely that WPZ and ETP will retain their distributions as ETE and WMB need the IDR cash flows–they will work to protect them, and have said they will continue to do so. TRGP is interesting now because of the dramatic drop in value in the past two years due to their exposure to NGL price margin squeezes. They have reduce that somewhat now with a greater emphasis on fee contracts, but the NGL market is turning and with their export business they are the most leveraged to a bullish turn. All of these names have moved significantly higher recently so they are vulnerable to a market correction. But the charts look good, the fundamentals are improving and they are still undervalued compared to peers/market, imo. Please do your own DD. Hope this helps. Beerthirty, back in a bit with numbers as we have them. RE 87: On the midstream names mentioned, TRGP and WMB are C-corps so they are retirement plan investable. EPD, TRGP and WMB pay no IDRs and WMB collects them from WPZ. WPZ, ETP and MPLX all pay IDRs that are significant (up to 50%) of their DCF. I hate that, but the market has adjusted their valuations so current buyers receive very attractive yields despite the IDRs. I'm not expecting much growth in distributions in the next 1-2 years but the yields are attractive enough. MPLX will likely grow the fastest, as they have guided to double digit growth this year and going forward. re 87 / 89 – appreciated, not our pond but know some here follow. RE 85,86: CLB says Q2 "should mark the bottom of our anticipated 'V-shaped' worldwide commodity recovery that should lead to increased crude oil prices followed by increased industry activity levels worldwide." RE 90: Responded to the request in 80.
re 91 – SLB on the tape, in line revenue, pre tax margins better than expected (though NAM pre tax margins were crushed into negative territory), EPS at $0.40 a penny better. Tough 1Q/2Q comments. Deets in the morning post. re 92 – yes I know, thanks for doing so. Thanks nrgyman, it narrows down the field for me to do my homework. SWN on the tape, reading, back in a bit. Anyone else get a 503 error on this site? #98-yes,forever opening and then error msg. re 99 – thanks, Washington, we have a problem. Re 98 I've noticed I can rarely get your oil quote link to work on my iPhone. Just spins. Laptop – works fine.